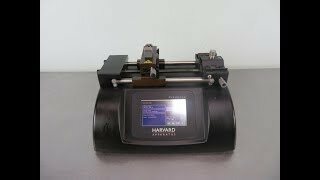 The Harvard Apparatus PHD Ultra Syringe Pump handles both infuse and withdraw and provides high accuracy for flexible use in mass spectroscopy, calibration, drug and nutritional infusions, microdialysis, dispensing, chromatography and LC/HPLC. This microprocessor controlled syringe pump features an easy to navigate full color touch screen that displays operation in real time with onscreen graphics. This infusion pump also comes with preprogrammed methods. The small step angle stepping motor of the PHD Ultra, drives a lead screw and pusher block, with a step rate range of 26 µsec to 27 sec per µstep, to eliminate flow pulsation. This infusion withdrawl pump has a flow rate between 1.56 pl/min- 216 ml/min depending on the syringe with a flow accuracy of 0.35% and reproducibility within 0.05%. The accompanying software for the PHD Ultra allows users to select from common syringe models, input custom specifications, calculate cross-sectional areas, and calibrate the flow rate and volume accumulation. This Harvard Apparatus PHD Ultra Syringe Pump has been fully inspected and is performing as expected. All of our lab equipment comes backed with our standard warranty. Should you have any questions, please don't hesitate to contact us.